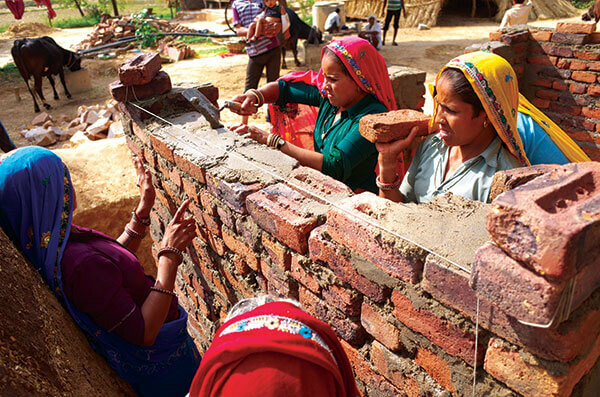 AmritaSREE has a growing presence across the nation, with the SHG women in many villages being taught plumbing and being hired to construct their own toilets under supervision. It is the women of the SHGs who construct toilets for themselves as well as for the rest of the village, earning a livelihood for themselves and making the Amrita SeRVe villages open-defecation free. This has been made possible under the guidance of the AMMACHI Labs, Amrita Vishwa Vidyapeetham. The Jivamritam Water Filtration System programme, launched in October 2017, provides clean drinking water to villagers, installed in areas with the most highly polluted water sources. In many areas it is the AmritaSREE women who are in the forefront, working to secure the necessary permissions from the Panchayat and then harnessing the support of WNA, Amrita Vishwa Vidyapeetham to install and operate these water systems.